Tell us about the Best Bites in Boroondara for a chance to win dinner for two! Between 1 to 31 March 2018, you can enter our Best Bites in Boroondara social media competition and be in the running to win a dinner for two at your preferred Boroondara restaurant (to a value of $100). To enter, simply hop onto Facebook, Twitter or Instagram and post a photo of your plate using the hashtag #DineAroundBoroondara and tag the restaurant. Boroondara is home to more than 1,000 eateries offering cuisines from around the world for every budget and occasion. Whether you are looking for an ambient caffeine hub, authentic pizzeria, speciality provedore, rooftop bar or fine dining, you don’t have to travel far. We know how much our community values the variety and quality of the eateries Boroondara has to offer. Now you have the opportunity to shout from the rooftops (or at least from your social media account) about how much you love our local fare. The winner will be announced by 4pm on 6 April on the social media channel in which the competition was announced. 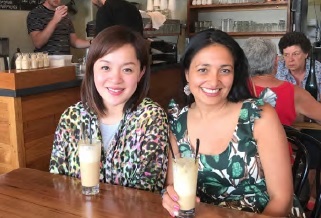 Local mums Kim and Karla love cafés and restaurants with good food, coffee, ambience and most importantly a kid-friendly atmosphere. Some of their favourites include Ora for great coffee, Kuche for delicious selection of food (both in Kew East), District Pho (Deepdene) for a quick Vietnamese pho, Our Little Secret (Camberwell) for weekend get-togethers, and Centonove (Kew) for a special night out. We love to go to places within walking distance from home or school and luckily there are several to choose from. We also like to try new places in neighbouring suburbs, said Kim. To encourage members of the community to promote their favourite café or restaurant to others, Boroondara City Council has organised a ‘Game of Chance’ competition. This Competition provides an incentive for participants to engage with their local community. The information on how to enter and the prizes form part of these conditions of entry. By entering into the Competition, participants are deemed to have accepted the terms and conditions of entry. The Promoter is Boroondara City Council of 8 Inglesby Road, Camberwell, VIC 3124. Participants must be Australian residents currently residing in Melbourne who have an account on Facebook and/or Instagram and/or Twitter. Participants must be over 18 years of age at the date of entry to the Competition. Employees of Boroondara City Council and their immediate families are ineligible to enter the Competition. Immediate family means any of the following: spouse, ex-spouse, de-facto spouse, child or step-child (whether natural or by adoption), parent, step-parent, grandparent, step-grandparent, uncle, aunt, niece, nephew, brother, sister, step-brother, step-sister or first cousin. To enter the Competition, participants must publicly post a photo of their food or meal while dining at their favourite restaurant or café within the City of Boroondara to Facebook, Twitter or Instagram. 7.1 Each participant is permitted to enter the Competition once for the channels included in the competition: Facebook, Twitter and Instagram. Participants must mention in the post the name of the café or restaurant at which the photo is being taken and, where possible, tag the café or restaurant’s Facebook page or Twitter page or Instagram page relevant to that channel. Entries that are not posted in English will be ineligible to win a prize. Entries must be the intellectual property of the participant. The entry period commences at 12AM on 1 March 2018 and closes at 12AM on 1 April 2018. Any entry received after the entry period will be ineligible to win a prize. The Promoter takes no responsibility for late, misdirected or incomplete entries. The winner will be drawn on 6 April 2018 at Boroondara City Council and announced by 4PM on 6 April on the Facebook, Instagram and Twitter posts in which the competition was announced. Boroondara City Council reserves the right to draw reserves in case of an invalid entry or ineligible entrant. The Promoter requires contact information from the prize winner in order for them to collect their prize. The prize winner must provide their contact details to the Promoter via direct message on the relevant social media channel on which they have won the Competition. The prize winner must provide proof of identity in order to collect their prize. If the prize winner fails to respond by 13 April 2018, another participant will be selected. The prize consists of 1 x $100.00 voucher to be redeemed at a café or restaurant located in the City of Boroondara of the prize winner’s choice. The total value of the prize pool is $100.00 (inclusive of GST). This prize is not exchangeable or redeemable for cash or other prizes. The prize is provided by the Promoter. Transport, parking and any other costs associated with redeeming the prize are at the winner’s expense. The prize can be collected at 8 Inglesby Road, Camberwell, VIC 3124 or it can be mailed via registered post to a postal address provided by the winner within 28 days after the draw. All prizes are subject to availability, non‐transferable and not exchangeable. All prizes/giveaways are non‐transferable. The Promoter will not be responsible or liable if for any reason beyond their reasonable control any element of any prize is not provided. The Promoter may, subject to State regulations, substitute a different prize of equivalent value in place of any prize referred to in these terms and conditions. The prize does not include any other costs of a personal nature not stated. This prize must be taken as stated and no compensation will be payable if the recipient is unable to use it as stated. The Promoter shall not be liable for any loss or damage whatsoever which is suffered (including but not limited to direct or consequential loss) or for any personal injury suffered or sustained in connection with any prize/s except for any liability that cannot be excluded by law. The personal information requested as contact information to claim the prize is being collected by the Promoter for the purpose of conducting the Best Bites in Boroondara Social Media Competition. The personal information will be used by the Promoter for that purpose. The personal information collected will not otherwise be disclosed unless permitted or required by law. If the information is not collected your entry to the Best Bites in Boroondara Social Media Competition may be ruled ineligible. Requests for access to and/or amendment of personal information should be made to the Promoter’s Privacy Officer. To the extent permitted by law, all participants release from, and indemnify the Promoter against all liability, cost, loss or expense arising out of acceptance of any prize(s) or participation in the promotion including (but not limited to) loss of income, loss of opportunity, personal injury and damage to property, whether direct or consequential, foreseeable, due to some negligent act or omission or otherwise. Participants retain the copyright of any post or photo (‘works’) submitted. By entering the Competition, participants grant the Promoter permission to display and publish the works in digital, in print and online. By entering the Competition, participants indemnify the Promoter against all and any actions, claims or damages arising from any infringement of copyright by the participants that may be taken against the Promoter. All decisions and actions of the Promoter relating to the Giveaway and/or redemption of the prizes are exercised at its absolute discretion and are final. No discussions or correspondence with participants or any other person will be entered into. The Promoter accepts no responsibility for any incorrectly submitted, incomplete, late, lost or misdirected entry cards or for any technical malfunction of any communications network. There are no charges to enter the Competition. The Promoter reserves the right, at their discretion (a) to adjudicate on the eligibility of applicants; (b) to disqualify any participant where the Promoter reasonably suspects any unlawful or improper conduct, such as infringing a third party’s intellectual property rights; or (c) to modify, suspend, terminate or cancel the competition, as appropriate. The Promoter reserves the right to request winners to provide proof of identity and proof of residency in order to claim a prize. Proof of identification and residency considered suitable for verification is at the discretion of the Promoter. In the event that a winner cannot provide suitable proof, the winner will forfeit the prize in whole. Participants acknowledge that this promotion is in no way sponsored, endorsed or administered by, or associated with, Facebook, Instagram or Twitter. In participating in this promotion participants are providing information to the Promoter and not to Facebook Instagram, or Twitter.